#1 I’m looking for a roofing contractor near me. Are you nearby? Installation of new Eagle tile on a home in Phoenix, AZ. Express roofing has been Maricopa’s premier residential roofing company for 20 years. We are proud to serve the following areas. Give us a call to learn more about our work in Mesa, Chandler, Gilbert, Ahwatukee, Tempe, Phoenix, Scottsdale, Fountain Hills, Paradise Valley and Sun City. #2 Can I read reviews of your services from people near me? Yes! Absolutely! Check out our reviews. #3 What makes you a better choice than other roofers in my area? We’re glad you asked. We’re family-owned and operated and we treat our customers the way we want to be treated. In addition to outstanding craftsmanship, excellent project management, and the industry’s best customer service, our customers have the peace of mind of knowing that we’ve been serving this community for 20 years and we’ll be around when they need to call on us again. We’re not going anywhere. Learn more about our history in the local construction industry. #4 Can I see examples of your work with shingles, tiles, and flat roofs? 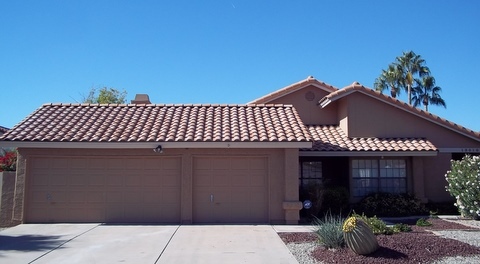 A finished shingle roofing project in Chandler, AZ. Yes. 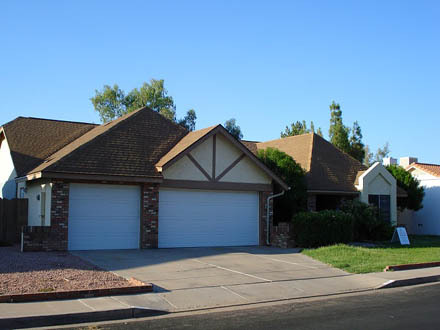 Over the years we’ve developed expertise in all of the various types of roofs common in Arizona. Check out our roofing photo gallery. We’re sure you’ll see something similar to your home and other homes in your neighborhood. If you don’t see exactly what you’re looking for, give us a call. #5 Can I get a free estimate? Yes. Please get in touch today. We’ll schedule a visit to talk about your roof, inspect it thoroughly, and give you an honest and straightforward estimate of the work that is required to repair or replace it. Have more questions? Please give us a call at 480-226-4245. We’re here to be of service.